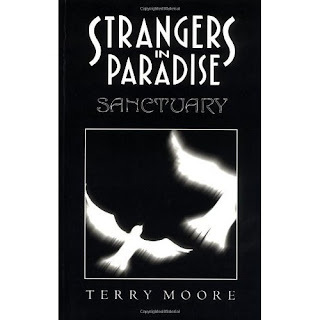 Anyway, what I'm here to tell you (besides that I'm editing) is about a book called Strangers in Paradise by Terry Moore. It's a touching, sometimes heart-wrenching story about two women who meet and have a life. Sometimes together, sometimes apart. As a comic book, it stands out for being self-published by the writer/artist but also because the art itself is excellent: people are drawn as people and not cartoons or superheroes. Yes, the art is cartoony (much the same way some manga art is) but still it's refreshing and realistic in ways only comic book art can be. While the story is also sometimes manipulative (what good story isn't, though?) there's a terrific payoff in the end. So, go check it out. It's on Comixology, it's on Amazon, there's even a great entry on it on Wikipedia.